The RWM 60 offers a compact solution to help tackle the ever-increasing packaging regulations and costs incurred with daily waste disposal. This machine is ideally suited to organisations handling low volumes of packaging waste and is mostly used by small retailers, hotels, restaurants, schools, takeaways, offices and organisations with limited space. The RWM 60 can handle cardboard, paper and plastic film. Bales of up to 60kg. Baling tape or twine would be suitable for this machine – both are in stock, available in various quantities, and are competitively priced. Plus, you can now conveniently purchase them in our secure online shop! 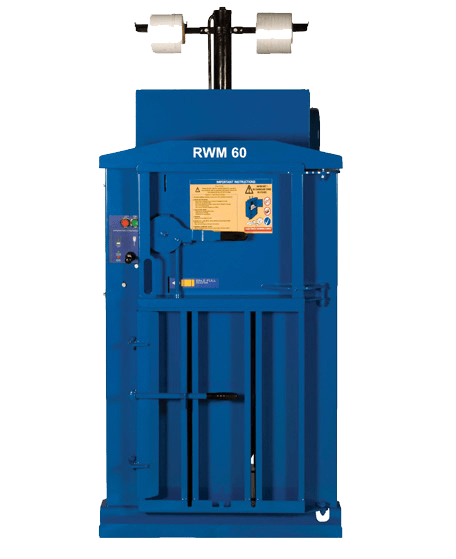 By visiting the dedicated RWM 60 compact waste baler page, watching the video of the machine in action, or by contacting us directly. People are welcome to call us on 01423 325038 for an informal chat or they can email sales@wastemachinery.co.uk to outline their requirements in more detail. We’ll be bringing you the next baler of the month feature in July, or why not follow us on Twitter for our latest news updates and offers?